I’ve had the honor of being part of Inmate Shopper. I can speak from years of experience that most prisoners rave about this publication! Inmate Shopper is what really pulled me into the world of Prison Services. I have a friend who is incarcerated (and well now I have many friends – obviously I’m into pen pals) who was always looking for new cool stuff to show off to his peers. I was always looking for little gifts for him! I would search the internet for “prisoner gifts”, “prisoner resources”, “what can I send my prison friend”, etc. and I felt as if I always came up short…finding little of nothing. One day I typed in “prisoner resource” into Amazon.com thinking maybe I’d find a book with good info for my pal. There was Inmate Shopper. While I couldn’t exactly tell if it was going to be something he’d like I decided to give it a shot anyway. I remember speaking to him on the phone the day he received it. He was so excited! Everyone around him wanted to borrow it. He explained to me how it was full of companies who had businesses solely dedicated to helping prisoners. Not only that but there articles that he said he enjoyed reading. He told me I should definitely get my business into Inmate Shopper so I soon after sent them an e-mail asking about advertising rates. At the time, George Kayer (the founder) responded to me. I had sent him a brochure from my pen pal business (penacon.com) and he mentioned that he loved my brochure and asked if I was the one whom designed it. Of course I was. I have a degree in Computer Arts…it’s what I do…it’s one of many of my passions. A couple months later I was designing the next issue of Inmate Shopper. George Kayer is a lifer serving time in Arizona. I was beyond amazed at what he was able to accomplish from prison. However it became too much for him to handle when his health wasn’t at it’s best and he decided it was time to pass on Inmate Shopper to someone who could handle it the way it needed to be handled. To take it to that next level that it so deserved. That’s when my colleague, Diane of Freebird Publishers, (who had already been helping with the last couple of issues before George sold it) decided to step in and buy Inmate Shopper. Since then I have worked under Diane in designing the Inmate Shopper. Diane has this book now full of up-to-date information, resources, entertainment, sports, news & articles and so much more. You have to see this book to understand just how amazing it is for a prisoner. Most of our customers are returning customers. They buy it once and continue to come back because they know what it has to offer! It’s a prisoner’s must have! I’m including the information below. If you’re hoping to impress your prison pen pal (or loved one) purchase them a copy today. They’ll thank you! Everything a prisoner could need while in prison is averrable in the Inmate Shopper. 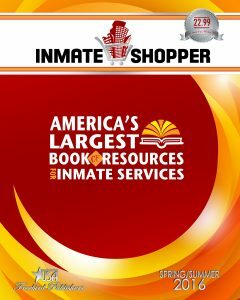 Inmate Shopper is published twice a year. Their current issue is 320+ pages of new content every issue, constantly updated with products, services, resources, news & more!